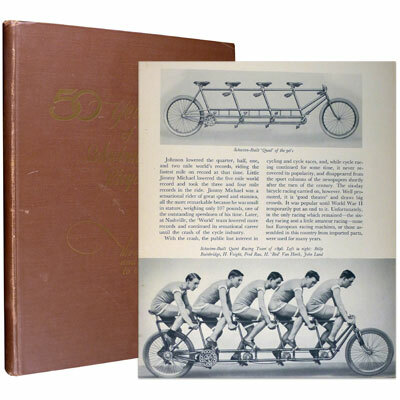 Fifty Years of Schwinn-Built Bicycles – The Story of the Bicycle and its Contributions to Our Way of Life - Frank V. Schwinn 1945 - Arnold, Chicago - First Edition	Published to commemorate the 50 year anniversary of Schwinn bicycles, 1895-1945, this profusely illustrated book features numerous photographs, drawings, and vintage advertisements in colour, sepia, and black and white, as well as a tribute to Schwinn company founder, Ignaz Schwinn. This copy also features a typed letter from Frank V. Schwinn, dated March 7th 1949, to the book’s previous owner, Mr. J.R. Davies, thanking him for his letter on behalf of his father, Frank W. Schwinn. Provenance: From the library of J.R. Davies, with his letter from Arnold, Scwinn & Company affixed to the front free endpaper.